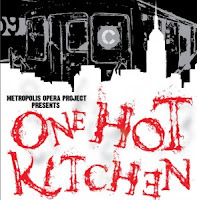 Theaterspeak : One Hot Kitchen Opens at the Metropolis Opera Project - and it's HOT! One Hot Kitchen Opens at the Metropolis Opera Project - and it's HOT! "I first met Paris as a temporarily homeless waif of six years old, an evacuee from the LA earthquake...It’s funny that now Paris is a hot up and coming singer/songwriter and generally awesome bride-to-be, and she’s in my opera playing—what else—a homeless waif..."
What is One Hot Kitchen? One Hot Kitchen is a ninety-minute slice of life comedy-drama, with five vignettes in a stack of apartments in a 5-floor Hell's Kitchen walk-up. The form is Opera Electronica. Kristin’s as talented as she is smart, and for my part, the sound she’s creating has a vibrancy, an immediacy and a relevance that can draw a whole new audience into the world of opera and all its forms. OHK was originally a play called Hell’s Cuisinart, that I wrote in the mid-90s when I moved into a Hell’s Kitchen walk-up. It was produced at the Samuel Beckett, and in Miami and L.A., and got a great response. 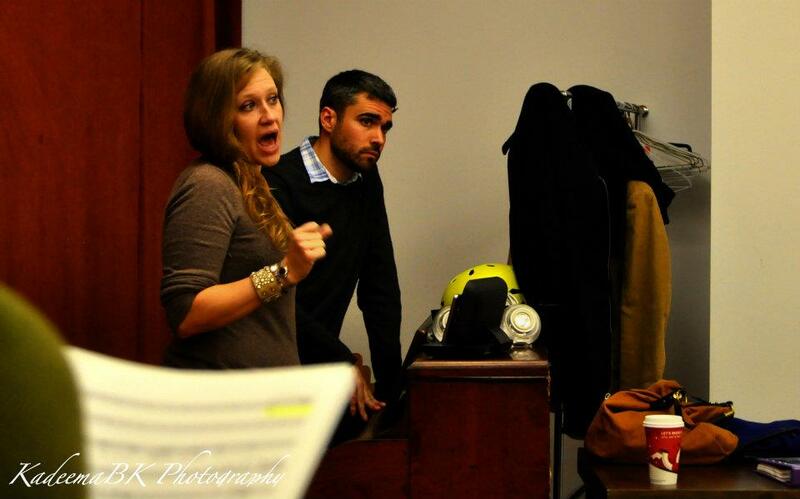 The opera came about when my friend Zachary James, Metropolis Opera Project’s Founding Artistic Director, brought Kristin to my play South Beach Rapture in last year’s FringeNYC. Afterward, they asked me to write something for the company, and when we discussed possibilities, Hell’s Cuisinart just seemed like a great fit. In adapting the libretto, I also rewrote the play substantially, bringing it up to the current date and exploring new themes or rather the same themes after twelve extra years of living. 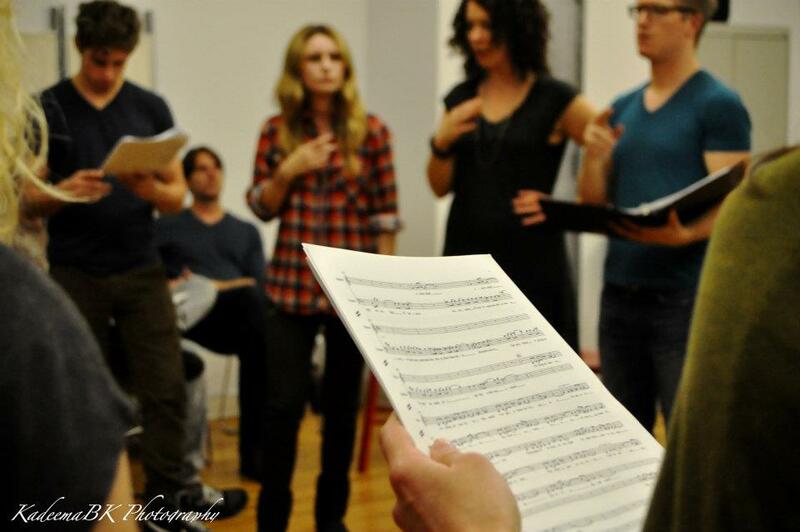 As mentioned, the amazing Zach James and M.O.P., and composers Kristin Hevner Wyatt and Daniel Wyatt. 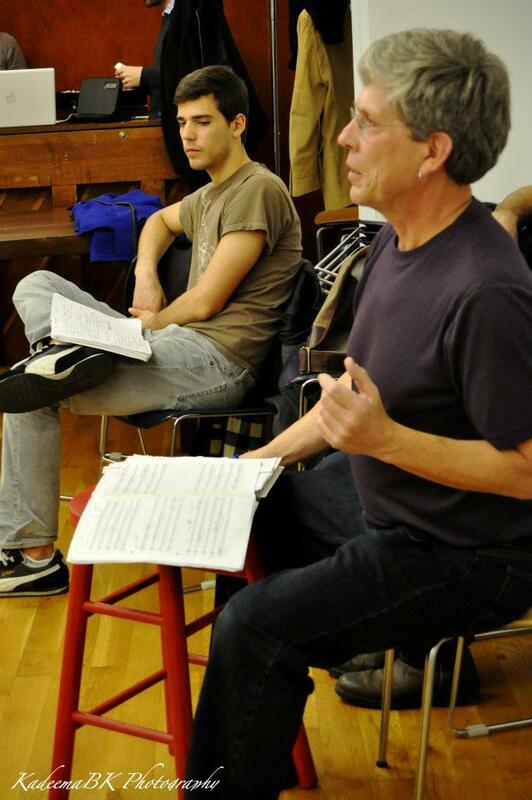 The director is Norm Johnson (pictured right), who took a sabbatical from teaching at Ithaca College to work on this. Several of his former students are in the show and they are a talented bunch! (Zach is also from I. C., and has crazy pipes but unfortunately he’s too busy playing Lurch in the Addams Family to perform in the show.) Soprano Caroline Selia and I worked on a project last year with Kristin, a sort of trial run for our collaboration, and Caroline and I share a birthday the day after we close, so that’s special. And we have a great texture to the piece in the form of soulful rock/guitar & vocals with Paris Carney. I first met Paris as a temporarily homeless waif of six years old, an evacuee from the LA earthquake. I gave her and her family a place to freshen up, and got to know her lovely mom, Marti, who’s become a great friend. It’s funny that now Paris is a hot up and coming singer/songwriter and generally awesome bride-to-be, and she’s in my opera playing—what else—a homeless waif. I developed the libretto of OHK working closely with Kristin. As I began to distill and stylize the language, she would give structural notes based purely on her musical ear. In every case, her notes led me to great discoveries about content, character, and pacing. I brought the work into the Dorothy Strelsin New American Writers Group at Primary Stages as it came up, and got some great feedback there. Norm Johnson also had some valuable insights as we discussed casting. It’s been an amazing process. 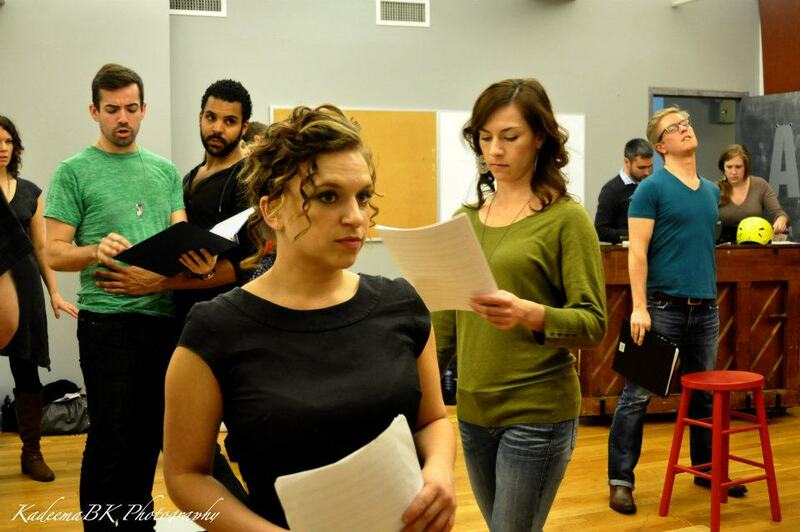 Tell me about the Metropolis Opera Project. My background is actually really eclectic. I’m a fine art painter with an MFA in Set and Costume Design (UConn) It took awhile for me to really focus and discover that my main medium is words. Still to pay the bills, I paint paintings, scenery and costumes for bway, tv and film. I also sang tenor in a few choirs, and love music, so this entree into opera has been fabulous. Plus, I'm writing a musical called Show People about the teenaged NYU student who founded the Actors Fund in 1882. I just received a grant for that one from the Anna Sosenko Assist trust. Anyway, I’m grateful that I can fuel my major passion with other passions/interests like painting, and grateful too for the background I have because I know the nuts and bolts of theatre from so many different directions. This helps me see the worlds I’m creating with clarity, subtlety and confidence. My settings, for example, are always a character in my plays. The Sunken Living Room, (Samuel French) is even the title character. And in OHK, again, it’s the Kitchen, it’s Hell’s Kitchen, and if it’s too hot, you know what you gotta do, right? In the James Liptonian tradition, what's your favorite curse word? My favorite curse word is actually two words: “shoot fuzzy” My grandmother used to say that as a polite substitute for a couple of other choice words. What's coming up next for ya? Next up I believe is my play Visiting Hours premiering in New Orleans in the spring, by a new and great company called the Rising Shiners, directed by Ann Mahoney Kadar. It’s a play about a middle-aged Lesbian couple whose adult son is in trouble with the law. It’s set in my home town of Miami and is about that moment when you have to just face facts that things will never get any better than they are. I think the play speaks volumes about gay family values by depicting gay parents in a nightmare all parents dread, but sticking in there together and trying to tough it out. I think there will be a reading in NYC soon as well, but I don’t have details. What else is inspiring you theaterwise or otherwise in the world today? Occupation is the word these days. It’s thrilling to see the apathy of the comfortable 80s-90s and the terrified/tentative 2000s giving way to a new era of action. I was actually in Rome during their Occupy event, which became a bit dangerous as a splinter group firebombed cars and broke store windows. Most of the people were peaceful but as we’re starting to see, peace can only last so long. The movement actually speaks to the message of OHK, which is basically that where you live and what you have is not nearly as important as who you’re with and how you treat them. Come see OHK, and if anyone feels like supporting a great company in a major undertaking, go to rockethub.com and search for One Hot Kitchen. Depending on the size of the donation, you could get a song written just for you! One Hot Kitchen plays through Thursdays thru Sunday now to December 11, 2011 at Medicine Show Theater, 549 West 52nd Street, 3rd Floor, NYC, (10th & 11th Avenues) You can get your tickets here!